Hello, hello! How is your week going? Two more workdays until the weekend! Like the rest of the blogging community, I cannot believe it is already fall! I’ve always heard that time goes by quicker as you get older, and now I’m starting to believe it. I want time to slow down, but I also wouldn’t mind if it sped up a little bit. I’m anxious to see what my future has in store! Since toying with the Whole30 challenge, I have found a new favorite breakfast: 2 or 3 over-medium eggs, 1 large honeycrisp apple and 1 tbsp almond butter. This seems like a lot of food, but it fills me up until lunchtime. Speaking of the Whole30, over the weekend I definitely chose to eat a few things (like bread) that are off the plan. I am going to start over on day 1. My mom said she will do it with me for some added motivation. We can text each other pictures of our meals or something! Yesterday after work, I fully planned on going to the pool. I brought all of my swim gear and an extra pair of workout clothes just in case I felt motivated to lift weights after swimming. I drove straight to the gym after work, paid for a day pass and headed to the pool…only to find a lot of children taking swim lessons! I’m sure one lane was available for swimming laps, but it was filled with people already swimming. I could have gone back to the front desk, complained about my misfortune and left in a bad mood. I didn’t do that! I had my workout clothes, so I just changed and put on my tennis shoe (not a typo). I hadn’t been to the gym in a couple of weeks, so it felt great to be back! 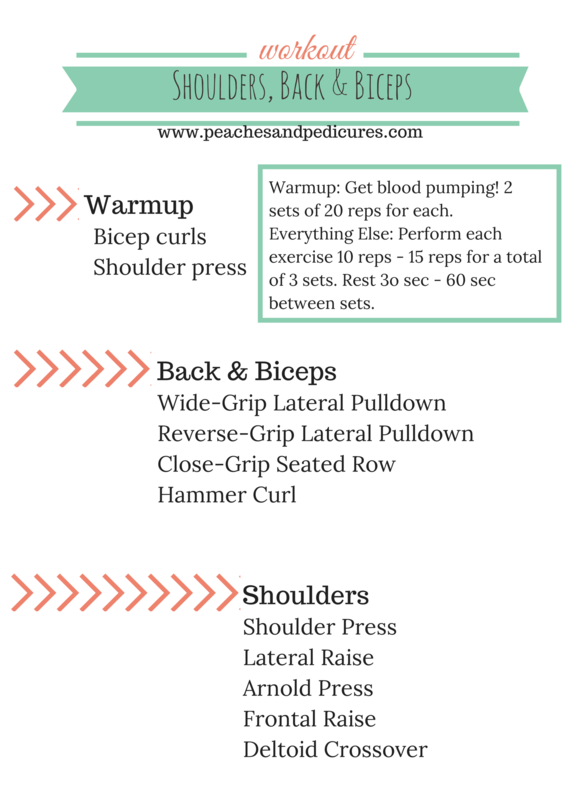 I did a strictly weightlifting workout focusing on my shoulders, back and biceps. I left the gym feeling strong and accomplished! Maybe today will be the day I finally hop in the water and test my swimming abilities! Do you regularly strength train? What is your favorite workout? If you could only eat the same breakfast everyday for the rest of your life, what would it be? Good morning, everyone! I hope your Tuesday is off to a great start! I did a few no-equipment YouTube workouts at home this morning, so I am feeling strong and mentally ready to go! I haven’t been working out lately because of my stress fracture, but I’ve found that I feel very sluggish. I am going to swim this week. No excuses! I have a few swim workouts to try and I bought a swimsuit, goggles and cap. So, I really have nothing holding me back. Do you ever feel frustrated about the way the events in your life are unfolding? If you occasionally do, I am with you 100 percent! Sometimes it feels like life just isn’t fair, and nothing is going my way (stress fracture, etc., etc.). Over the weekend, I went home and attended church with my family. The theme was gratitude. We talked about happiness and gratitude. Apparently, the happiest people are people with who feel the most gratitude not the other way around. Being happy doesn’t make you thankful. Being thankful makes you happy. I’m not an expert by any means, but I’ll leave you with that thought to think about! My minister challenged us to write a thank you note to someone who we are grateful for. I still have to write mine! Last night I made cauliflower pizza for dinner, and it is definitely my favorite cauliflower pizza to date! 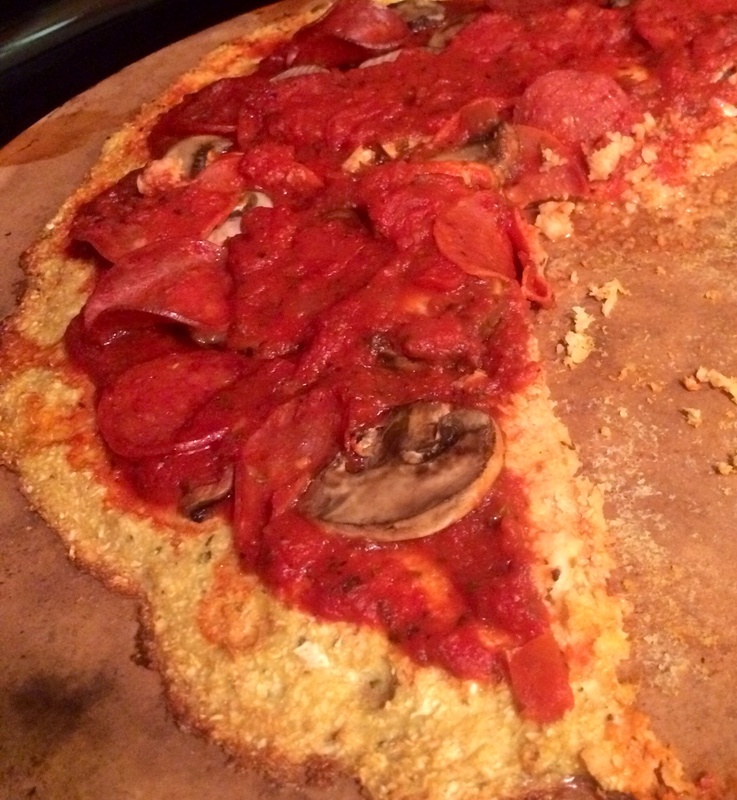 This cauliflower pizza crust was easy to slice and stayed in the shape of a pizza, unlike my previous cauliflower pizzas that were made with cheese instead of nutritional yeast. Coarsely chop cauliflower and pulse in a food processor. Place finely-pulsed cauliflower in a microwave-safe bowl, and microwave for three minutes. While cauliflower is being microwaved, mix the two eggs, 1 tbsp almond flour, 3 tbsp nutritional yeast and seasoning in a large bowl. Drain cauliflower then slowly pour cauliflower into the egg mixture. Mix until combined. Spread pizza crust mixture onto greased stone and press into pizza shape. Bake crust for 25 minutes or until the edges are browned. Cover crust with marinara sauce and scatter toppings. Bake for an additional 15 minutes.